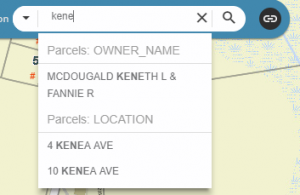 As you enter a street address or owner name into the box provided, it will provide auto complete options. You may select an auto-complete option and the application will zoom you to the appropriate location. If you are prompted with no results, chances are that specific address number and/or street may not exist or misspelled. In the future we will have a section to report issues. 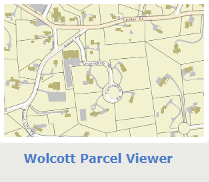 Allows the user to zoom in and out of the map to get a larger or smaller view of the town at preset scales. If you left click and hold the mouse button you will have the ability to pan around the map. Will re-center you map to the location of the Town Hall. This is your initial map extent. This will the use of location services (GPS) if a mobile device is used. Be aware it is not meant for desktop/PC use. The parcel will get selected and a pop-up box will appear. The information contained within the fields are updated on a daily basis. Tool A: Is the measurment tool and allows for area, path and pinpoint calculation. Tool B: Is the legend for the map layers. Provides the symbols representing the spatial objects. Tool C: The option to print in multiple formats is available. New users stay with deafult settings. Tool D: The public notification tool allows for pdf generated mailing lists to be created. Tool E: The layer lists allows users to turn layers on and off. List order corresponds with draw order. 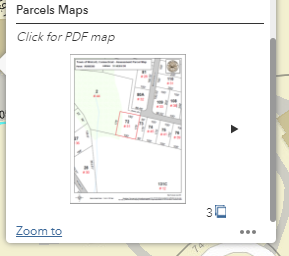 Tool F: Drawing tools available to add content or text to the map. Objects created will print. Tool G: Have the option to use a naviagtion tool for directions. Best if used on a mobile device. Tool H: Ability to bookmark an area of the map so you may revisit again without seraching. 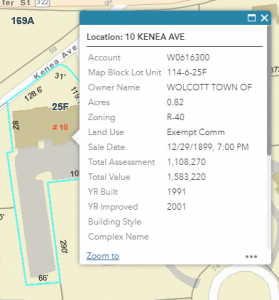 Tool I: Choose from a variety of basemap options that best fit your needs.